Yesterday, agent Lucienne Diver made a guest appearance on my friend Lee Lofland’s blog. Her topic was how writers can create buzz for their work and she brings up a lot of great ideas. On the comment trail there was a question posed about book trailers and whether or not they were a valuable marketing tool for authors. I replied to him, but thought this was a topic I could expand upon and make my own blog entry. This past Sunday my writers club meeting had Kemble Scott as our guest speaker. He has the distinction of being the first author to use YouTube to launch a novel. 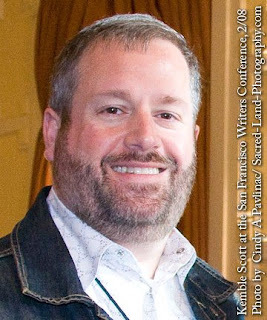 His novel SoMa is about the South of Market neighborhood in San Francisco and it has subject matter that is sexually explicit in nature. He knew that it was going to be near impossible for his book to be reviewed in mainstream publications and so he was casting about for ideas as to how to publicize his book. One of his neighbors worked for YouTube and suggested that he make some short films. Scott has had a career as a television journalist for years, but he was initially stumped at the suggestion. She then challenged him that with all his TV experience, he should be able to come up with something. He decided on a series of short promos showing some of the locations mentioned in his book. Along with showing the locales, he uses suggestive language to reference some of the unusual behavior in those places which are represented in his book. At first he had a professional help him with the filming, but when he viewed it he thought it looked too slick for YouTube. So he bought a $600 video camera and handed it to someone with no experience. He also changed it to black and white to give those short videos a grittier feel to match the tone of the book. The video clips preceded the publication of his book and his novel appeared on the San Francisco Chronicle’s best seller list the first week it was released. You can see him talking at Google’s corporate headquarters in the Authors@Google series. This video is about 42 minutes in total length, but he credits YouTube for the successful launch of his book at about 29:40 and he includes one of his videos as part of a demonstration. Those video clips didn’t generate a million hits like the Drama Squirrel video, but they did help generate word of mouth which translated into sales. And because he made a major newspaper’s best seller list, his book has been sold in places he would never have expected including an airport in Singapore. I finished reading his book, it is laugh out loud funny in parts, but it is blue. Very blue. It is not for those who are easily offended. Please tell me if you know of other authors who have successfully used video clips to promote their books. I would love to see more of them to get ideas for my own future reference. James O. Born has a unique approach to YouTube promotions for his books. They're funny, but definitely memorable. I'm glad to see your name on the roster of East of Eden speakers. I'm hoping to make it there this year. It would be great to see and chat with you again. You can see a variety of book video at www.readersentertainment.tv as well. There are stats and facts available about how they work, how effective they are, etc. But, I would hate to bore people with all that (though I am easily swayed!LOL). Booksellers love them. Libraries love them. Educators love them. Readers love them. Success stories? Yep! Got a lot of them. Any more I hate to just leave a URL to our testimonials page because people think I'm spamming (which I'm not, but I'm trying to be more sensitive when on someone else's blog) but I am happy to put up the URL if you want to read what people are saying their book trailer did for them. We have videos get tens of thousands of views and a few even get hundreds of thousands cumulatively. And though it's a good idea to be on YouTube just for the shear number of people who are there, the ratio of "view to buy" on YouTube is not so impressive. There are much better sites for books like Metacafe, bebo, Watch The Book, Preview the Book, etc. Thank you so much for stopping by and commenting. You have provided me with a wealth of new information to check out. I just subscribed to your blog feed as well. If you wouldn't mind adding a link in this comment section about success stories, I would like that. Perhaps you would be interested in writing something on this subject for my writers club newsletter. Hopefully you can just cull and recycle something you've already written on the subject. Thanks! You rock! I would love to write something for you. Just let me know where to send it. I was just interviewed by The Wall Street Journal so the timing would be cool!